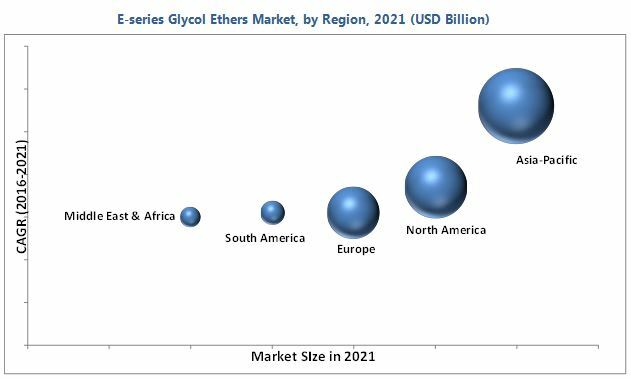 [154 Pages Report] The E-series glycol ether market is projected to reach USD 2.13 Billion by 2021, at a CAGR of 4.3% from 2016 to 2021. The value chain of the E-series glycol ethers market includes raw material manufacturers such as The Dow Chemical Company (U.S.) and BASF SE (Germany). The leading players operating in the e-series glycol ethers market include BASF SE (Germany), The Dow Chemical Company (U.S.), Eastman Chemicals (U.S.), Saudi Basic Industries Corporation (SABIC) (Saudi Arabia), Huntsman Corporation (U.S.), Shell Chemicals (Netherlands), Exxon Mobil Corporation (U.S.), Sasol Ltd (South Africa), LyondellBasell Chemical Company (U.S.), among others. The application areas of E-series glycol ether include paints & coatings, cleaners, automotive, pharmaceuticals, and others. Scope of the Report: This research report categorizes the E-series glycol ethers market on the basis of application, type, and region. The report forecasts revenues as well as analyzes the trends in each of these submarkets. The E-series glycol ethers market was valued at USD 1.64 Billion in 2015 and is projected to reach USD 2.13 Billion by 2021, at a CAGR of 4.3% between 2016 and 2021. Major factors driving the growth of the E-series glycol ethers market include high demand for E-series glycol ethers from diverse applications in areas owing to its exceptional properties such as high water solubility, low volatility, and effective strength. The E-series glycol ethers market has been segmented on the basis of type, application, and region. According to application, the market has been further classified into paints & coatings, cleaners, printing ink, automotive, chemical intermediates, pharmaceuticals, cosmetics & personal care, among others. Among all applications, the paints & coatings segment accounted for the largest share of the E-series glycol ethers market in 2015. This large share is mainly attributed to the latest technological advancements and development of new grades for different coating applications. However, pharmaceuticals is the fastest-growing segment. In the pharmaceuticals sector, E-series glycol ethers are used in several medical products, such as ointments, eye drops, and laxatives. Major types of E-series glycol ethers include EGPE, EGBE, and EGBEA that are used extensively in diverse applications areas. EGPE is a colorless, water-miscible solvent providing a slow evaporation rate, good viscosity control in waterborne resins, and high flash point. Ethylene glycol butyl ether (EGBE) is a key ingredient in numerous products, ranging from industrial and consumer cleaning solutions to water- and solvent-based paints & coatings. EGBEA is derived from the reaction of butyl ether, derived from monoethylene butyl glycol, with acetic acid. Asia-Pacific is expected to lead the E-series glycol ether market during the forecast period owing to the increasing use of E-series glycol ethers in varied applications such as paints & coatings, cleaners, pharmaceuticals, and others in this region. Major companies promoting E-series glycol ether are investing in this region. Some of the restraints that impact the growth of the E-series glycol ether market include low production volumes in comparison to other glycols such as P-series glycol ethers. Also, many types of E-series glycol ethers are certified as toxic in nature and may harm the environment and human health. Leading companies in the E-series glycol ethers market include BASF SE (Germany), The Dow Chemical Company (U.S.), Eastman Chemicals (U.S.), Saudi Basic Industries Corporation (SABIC) (Saudi Arabia), Huntsman Corporation (U.S.), Shell Chemicals (Netherlands), Exxon Mobil Corporation (U.S.), Sasol Ltd (South Africa), and LyondellBasell Chemical Company (U.S.), among others. 11.5 Shell Chemical Company Ltd.